Cannabis has shown promise in the treatment of PTSD. Despite this, it is not considered to be a qualifying condition for medical marijuana in the state of Colorado. Thanks to the passing of Amendment 64 and the opening of retail cannabis facilities in Colorado, veterans have been able to secure access to cannabis in a safe, regulated environment. However, the cost of adult-use cannabis in Colorado is notably higher than medical marijuana and these veterans are left to foot the bill. Operation Grow4Vets was founded in hopes of solving this problem in the Centennial State. Roger Martin, Executive Director of Operation Grow4Vets, launched the organization after his personal experiences with medical marijuana helped him realize that cannabis is not the harmful drug that he once believed it to be. After serving in the military, Martin was taking as much as 180 milligrams of oxycontin every day to treat chronic pain. At the same time, he took 20-30 milligrams of Ambien in order to sleep through the night. After trying to quit cold turkey on two separate occasions, Martin was advised to try suboxone treatment coupled with cannabis therapy. He was able to wean himself off the suboxone in as little as 5 1/2 weeks – such treatment typically takes 12-18 months. These days Martin relies on the use of infused ebiles to help deal with bouts of chronic pain. According to him, he eats a cannabis-infused cookie each night in order to silence the pain long enough to sleep for 4-6 hours each night. Based outside of Colorado Springs, CO, Operation Grow4Vets is on a mission to help as many veterans as possible find the same sort of relief he found. And more than the veterans alone – he explains that their families often suffer more than the veterans themselves. 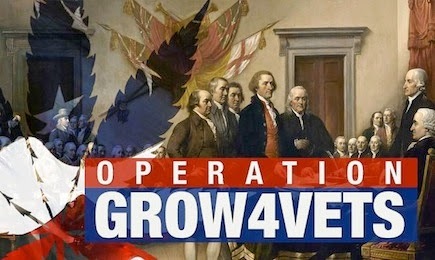 Operation Grow4Vets provides cannabis products (flowers, edibles, concentrates, cannabis oil, etc.) and cultivation equipment to as many military veterans as they possibly can. One step further, they teach interested veterans to learn how to set-up and tend their own personal gardens in the state. The organization has plans for a program starting at the tail-end of July that will help veterans find jobs in the rapidly-evolving cannabis industry.